Republican Bob Stefanowski and Democrat Ned Lamont. Democrat Ned Lamont holds a 13-percentage point lead over Republican Bob Stefanowski in the race for governor, according to a Quinnipiac University poll released Thursday, while a Sacred Heart University/Hearst Connecticut Media poll has his lead at four points. Lamont leads Stefanowski, 46 percent to 33 percent, in the Quinnipiac poll, with four percent for a petitioning candidate, Oz Griebel, and one percent for Rod Hanscomb of the Libertarian Party. “Ned Lamont is leading Bob Stefanowski by double digits thanks to huge support among women and Connecticut’s status as a true blue state. But there’s a lot of time until Election Day, and a number of undecided voters up for grabs,” said the poll’s director, Douglas Schwartz. The two polls, each conducted from Aug. 16 to 21, are the first since Lamont and Stefanowski won primaries on Aug. 14 and the first of the campaign by an independent poll recognized as reliable. Quinnipiac is the more established of the two polls, ranked highly by the profession and given a grade of A- by a political site that tracks the accuracy of polls, Five-Thirty-Eight. Sacred Heart’s Institute for Public Policy is not among the scores of polls tracked by the site. 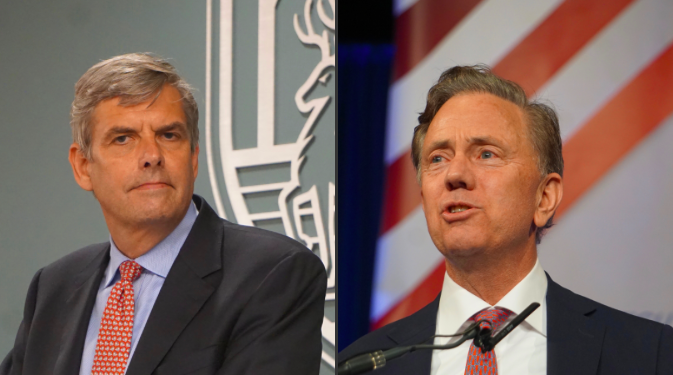 The SHU/Hearst poll had Lamont leading Stefanowski, 40.8 percent to 36.9, with no questions about the two other candidates who are expected to be on the ballot, Griebel and Hanscomb. “The Quinnipiac oversamples Democrats and ignores likely voters. It is not worth the paper it is printed on,” said Patrick Trueman, Stefanowski’s campaign manager. Republicans made a similar complaint in 2012 about polls in the U.S. Senate race between Democrat Chris Murphy and Republican Linda McMahon. Quinnipiac’s final poll had Murphy leading, 49 percent to 43 percent. Murphy ultimately won with 55 percent of the vote. Calling himself conservative on polls, Lamont said he is assuming the race is closer to the SHU/Hearst finding. “It’s still August, and there is a lot of baseball to play,” Lamont said. Quinnipiac used live calling to randomly selected land lines and cell phones to interview 1,029 voters, with a margin of error of plus or minus 3.9 percentage points. Sacred Heart used an automated calling system that prompts respondents to answer using their telephone keypads. Its margin of error is plus or minus 4.2 percentage points. The SHU/Hearst Poll found President Donald J. Trump has an approval rating of 30.5 percent, suggesting that Stefanowski’s embrace of the president in Republican primary will be no help in the fall. Gov. Dannel P. Malloy, who has been shunned by the Democratic nominee, fared worse at 15.9 percent. Electronic tolls, or at least expectations of their efficacy, were rated more highly than the president or the governor: About half the respondents said they “strongly agree” or “somewhat” that electronic tolls would be an effective way to raise money for transportation infrastructure. Quinnipiac found voters disapproving of Malloy’s performance, 67 percent to 25 percent, with 63 percent saying their opinion of Malloy would have no impact on their vote. Trump’s rating was similar, with 67 percent disapproving and 30 percent approving. “President Donald Trump seems to loom more largely in the minds of Connecticut voters than Gov. Dannel Malloy. Voters both approve and disapprove more strongly of President Trump,” Schwartz said. Stefanowski’s central promise — the elimination of the state income tax — would be welcomed by a plurality of voters, 49 percent to 35 percent. But a bigger percentage, 56 percent to 35 percent, say it is not realistic. Lamont called the question the most significant finding. Raising the hourly minimum wage from $10.10 to $15, which is favored by Lamont, was supported, 63 percent to 33 percent. Tolls, which Lamont says he would consider, were opposed, 53 percent to 40 percent.